This was the first project designed under Halifax’s new Downtown Redevelopment Plan and Nova Scotia’s first dual-branded hotel. The site. previously the home of the Citadel Halifax Hotel, is located adjacent to the historic Citadel Hill, a 19th century British Fort. The Citadel Halifax Hotel was originally built in 1963 as the Citadel Inn. A renovation in 1974, added 98 guestrooms in the Executive Tower. In 1980, three more floors and another 71 rooms were added. Over the next 30 years, the Citadel Halifax Hotel worked hard, providing a home for weary travelers and, by 2012, she was beginning to show her age. Renovate or Reinvent? Drawing on previous hotel successes, the property’s owners, SilverBirch Hotels & Resorts, called on Chamberlain Architects to create a design for this historical site. After careful consideration, it was decided that a complete redevelopment of the site was the best solution. With a blank slate and a prime location, the sky was, literally, the limit for this project. 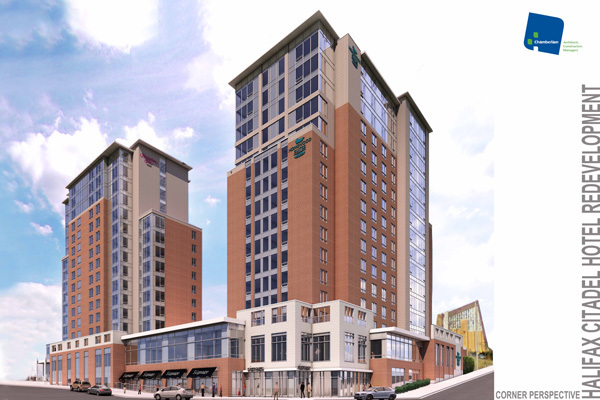 This premier project includes two 15-storey towers housing a Hampton Inn (181 rooms) and Homewood Suites hotel (135 rooms), with a total of 316 rooms as well as a residential building with 130 apartments, a variety of retail spaces, a convention centre and a 7,000 sf restaurant. SilverBirch Hotels & Resorts always demonstrated a long-standing commitment to the environment through various initiatives embraced by the company and at each of their more than 20 hotels across Canada. The Halifax site was no different. During demolition, their goal was to reduce the amount of materials that enter the waste stream. For example, carpets, underlays, toilets, sinks, tubs, doors, mill work and metals were all recycled. Even old concrete was sent to a facility where it was crushed and reused. use materials that integrated well with the surrounding area such as masonry - stone and brick, and curtain wall glazing. Perhaps the most important measure of this project’s success, is not just what it contributes financially or how much developers minimized its impact on the environment but how the neighbors have responded to it. This quote from Sky Scraper Page, a forum with over 700 posts and 100,000 views, where locals post photos and share thoughts on construction projects in their neighbourhoods, bodes well: “I think the architects came up with a very good balance of glass and brick. It has turned out to look even better than the architectural renderings”.